Scion - How eco-friendly are your winter woolies? Steam rises on an experiment in the biodegradation testing facility. Every time a synthetic garment is washed, it sheds thousands of fibres. These tiny fibres escape waste water treatment plant filters and end up in the ocean and along shorelines near waste water release sites. Fabric structure and composition affect fibre release. Studies have found that polyester fleece jackets can shed up to 0.2% of their weight with each wash and as the jackets age they shed even more. These fibres from our clothes could be having a disastrous effect on marine life. Microfibres have been found woven into the gastrointestinal tracts of fish and have potential to bio-accumulate in larger animals, spreading throughout the entire food chain. The Florida Microplastic Awareness Project advocates for cotton, hemp and linen as alternatives that break down and don’t threaten marine life. But what about wool? AgResearch and Scion are collaborating on a project that compares woolen fibres from garments and carpet with their common synthetic counterparts. Together we are looking at how the fibres break down in ocean water, using Scion's newly commissioned biodegradation testing facility. Scion's biodegradation testing facility can assess how different materials like bioplastics, wood or packaging materials break down over time and in different conditions, such as in compost, sea or freshwater. For this experiment, the amount of carbon inherent in samples of woollen and synthetic fibres from garments and carpet is measured. Then these samples will spend 90 days submerged in aerated jars of seawater collected from the ocean and heated to 30°C while the amount of carbon dioxide flowing out of the jars is measured by sensors. Carbon dioxide is a product of the aerobic degradation process. When the microorganisms in the seawater break down the microfibres, they release carbon dioxide. This study is comparing degradation of the wool and synthetic fibres. The samples that biodegrade the most over the 90-day time frame will show the most measured carbon content transformed into carbon dioxide. 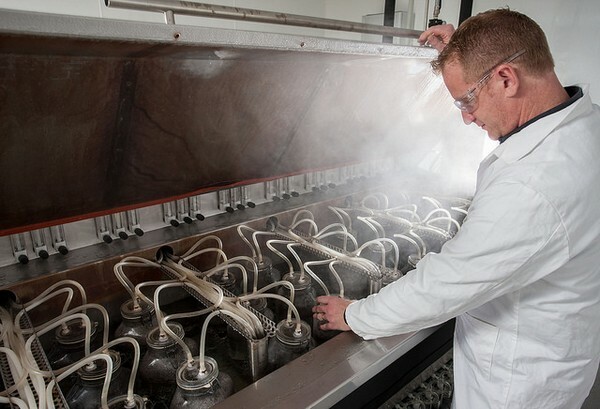 Scion’s biodegradation facility is the only automated biodegradation testing facility in New Zealand. The results from this study will help to establish the sustainability of New Zealand’s wool products. Scion Technology and Service Leader Lou Sherman says, “This kind of information will help consumers make informed choices about the products they buy”. The study will be completed in August 2018.